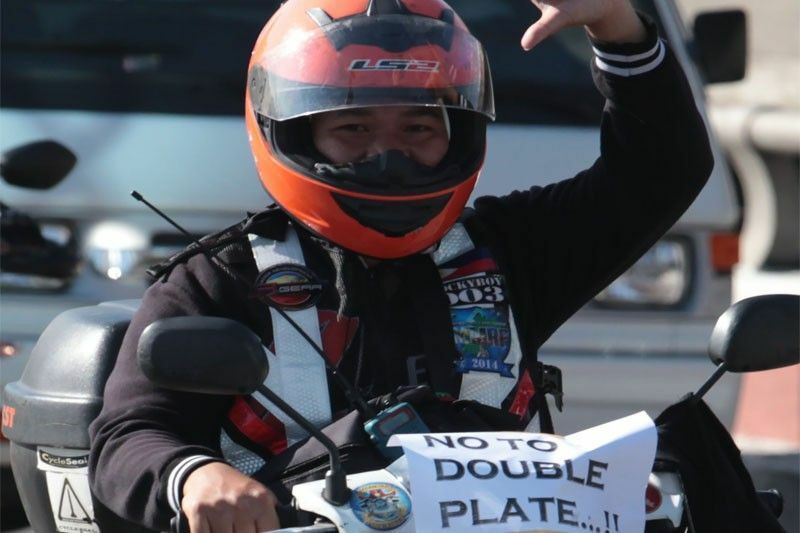 In this March 24, 2019 photo, a motorcycle rider joined a unity ride in EDSA to protest the oversized double plate number policy that was signed into law by President Rodrigo Duterte. MANILA, Philippines — Presidential spokesperson and Chief Presidential Legal Counsel Salvador Panelo on Monday reminded motorcycle riders to follow the controversial Republic Act 11235 or the Motorcycle Crime Prevention Law. Panelo said Duterte is no longer riding motorcycles due to his previous accidents but he cited the president’s daughter, Davao City Mayor Sara Duterte-Carpio, and said she will also comply. On Sunday, thousands of motorcycle riders conducted a simultaneous nationwide protest against the Motorcycle Crime Prevention Act signed into law by Duterte last March 8. The law seeks to prevent motorcycle riding criminals from getting away easily after committing a crime by requiring riders to have bigger license plates that are readable from the front, the back and the side of the motorcycle from a distance of at least 15 meters from the motorcycle. Lawmakers said plates that are bigger and with color-schemes make it easier to identify the registration of motorcycle. He added that he has yet to discuss the law with the president but he mentioned Duterte stands by it. The video showed the rescue dog surveying the area and then went under a collapsed part of the building.